SGRainbow marks its 5th year in the community. With this, we would like to thank all our sponsors and community partners who have been part of our journey and believing in our work. 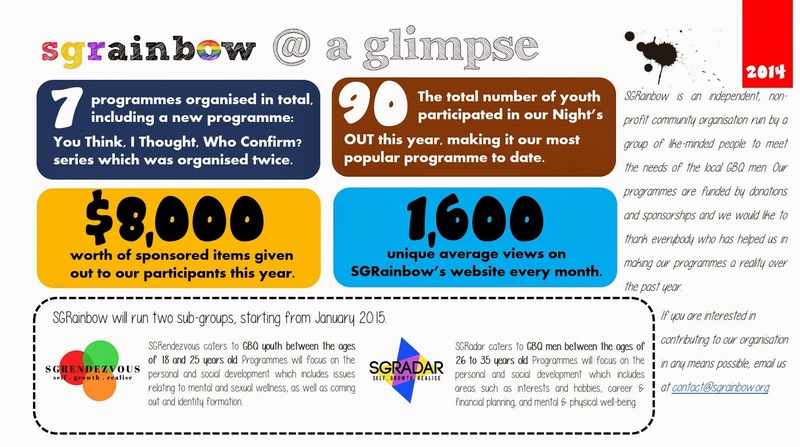 2015 will be another exciting year as we introduce two sub-groups that SGRainbow will run, both aiming to provide an opportunity for personal and social development. SGRendezvous caters to the 18 to 25 years old while SGRadar will cater to the 26 to 35 years old. We look forward to your continuous support and generous contribution in the upcoming year. Thank you!